I am blessed with natural water sources for the bees. I also see them on the mineral blocks after a rain. I don’t have a natural water source on my land, so I use 5 gallon chicken waterers with pea gravel so they don’t drown. About once a week I fill ’em up. Beats getting a call from the neighbors about bees in their pool. Can’t think of a better reason to put off mowin’. Plenty of equal ones, but none better. Here is a shot I took of one coming to an old deserted pool nearby. They use the duckweed to light on and draw water from between the duckweed leaves. 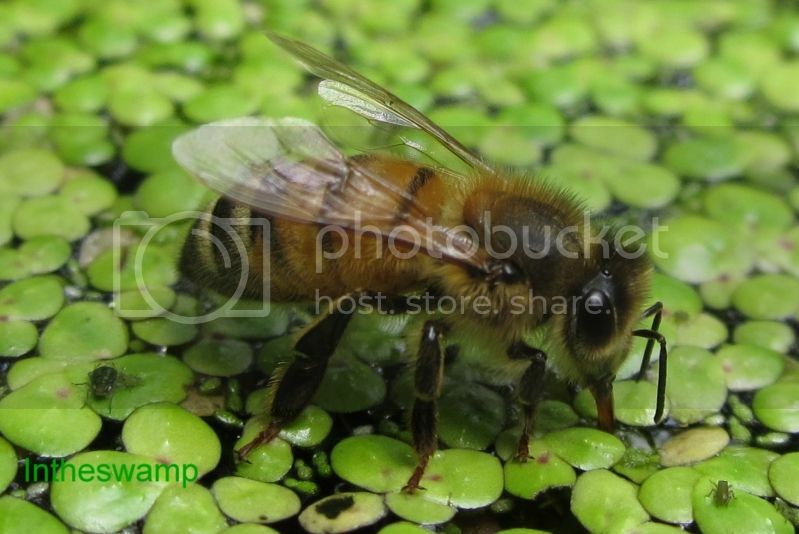 Note the locals hanging out on the duckweed leaves with the bee.